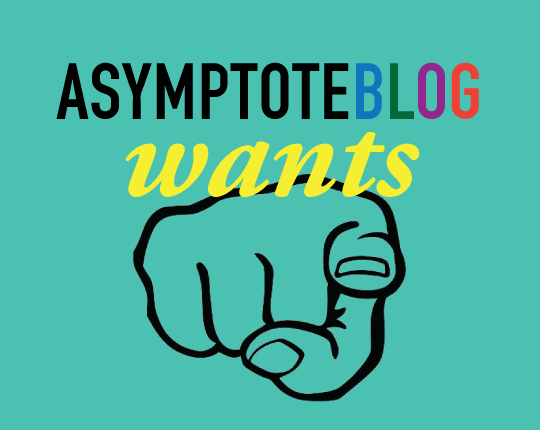 Asymptote Blog Wants YOU to Lead the Conversation! Asymptote blog is on the constant lookout for individual voices, probing analysis, and topicality. Fran Leibowitz once said: “Magazines all too frequently lead to books and should be regarded by the prudent as the heavy petting of literature.” In that spirit, the Asymptote blog is looking for more book-lovers like yourself to contribute to the global conversation on literature and the arts in translation. Showcasing new translations and daily writings on world literature and culture, Asymptote blog is on the constant lookout for individual voices, probing analysis, and topicality in our postings. We have published pieces on topics ranging from pop music and children’s books to political calls-to-action. Apart from essays, we run dispatches from international literary events, interviews, weekly new translations, book reviews, and more. Like our journal, we are looking for creative, original, and highly engaging work that considers the role of translation in literature, the arts, and the fabric of everyday life. We encourage writers of all stripes and colours to engage with global issues as well as particular interests. At Asymptote, we’re all about breaking borders and boundaries, and are looking for writing that does the same.